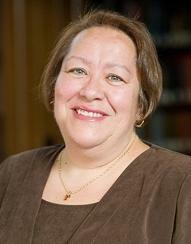 Currently Daisy L. Machado is professor of the history of Christianity at Union Theological Seminary in New York City. Prior to this, she served as vice president for Academic Affairs and dean at Lexington Theological Seminary in Kentucky. Machado, who has taught seminary for fifteen years, is an ordained minister in the Christian church (Disciples of Christ) and has served inner-city Latino congregations in New York City, Houston, and Fort Worth, Texas. In addition to her book Of Borders and Margins (Oxford University Press, 2003) and her coedited volume, A Reader in Latina Feminist Theology: Religion and Justice (University of Texas Press, 2002), she is author of numerous book chapters and encyclopedia articles. “The Supreme Court has repeatedly said not only that the academic study of religion is constitutional but also that it is important. For example, this ruling in the 1963 religion and public education case, ‘It might well be said that one’s education is not complete without a study of comparative religion or the history of religion and its relationship to the advancement of civilization. It certainly may be said that the Bible is worthy of study for its literary and historic qualities. Nothing we have said here indicates that such study of the Bible or of religion, when presented objectively as part of a secular program of education, may not be effected consistent with the First Amendment,” (Washington Post, “On Faith,” archived debate). The challenge again falls into the categories that theological schools have been dealing with since their inception: how do you teach faith? And to give it a more historical ring: How does faith seek understanding? Teaching religion and the sacred texts of those religions is not and cannot be a purely scientific and neutral task; religious education should be subversive education because it dares to hold up a mirror to our culture and our world. However, in the case of the United States, because of its long history of manifest destiny and empire, because it has created and upheld its national myths by using biblical language and religion (i.e., the United States as “the ark of salvation of the nations,” as the “light upon the hill”), Prothero’s suggestion to teach religion in the public schools can only be fraught with controversy and bitter debate. From those that decry the Bible Literacy Project as a tool of the Religious Right because of the names that make up its board, to those who see this type of education as a way to continue to blend Christianity and capitalism, to those who call for a strict separation of the teaching of any religion in a public institution, how will the reality of such a profound religious and biblical illiteracy in this nation be addressed? For seminaries and schools of theology, this question must translate into a matter of curriculum. What do Bible courses need to look like in order to respond to the lack of basic biblical knowledge found in the majority of seminarians? But beyond Bible courses, this same biblical illiteracy has an impact in theology and homiletics classes, in ethics classes, and in church history courses, as well as worship classes and, of course, in Christian education courses. But can we truly believe that the newly entering seminarians of Prothero’s future will have more biblical know-how and be more in tune with religion, more open and aware of the role of religion in social change, because they have studied religion and the Bible in high school and then built upon that with more classes in college? I have many doubts about this scenario precisely because the problem is not that people in the United States don’t know much about the Bible, but that they basically don’t care and this is an entirely different matter. The crucial challenge to seminaries that are engaged in the theological enterprise is to make religion (in this case Christianity) and the Bible truly matter. The challenge for theological schools is to do what McKenzie notes has not been done or has been done ineffectively: to really engage the world with our scholarship; which means to intersect our teaching/curriculum across our disciplines with the living communities that surround our schools. The hard fact is that the diverse world we live in demands a seminary curriculum that dares to engage the world, so that our students can begin to see how the Bible matters and how Christianity can not only speak a word to the politician whose ethical behavior brings us all shame, but also reexamine our nation’s concepts of wealth and poverty given the present economic crisis we all face — or to look again at how the manifest destiny inherent in our history continues to influence our attitudes, from immigration to what it means to be a nation of such military power. And this is also the time to take a very close and hard look at the many communities of faith that our theological schools and seminaries have ignored for so long. Making the Bible matter and teaching biblical literacy means to learn from and respect those many communities, especially racial and ethnic communities, for whom the Bible has been the core text for their survival in a society filled with racism and fear. Having grown up in a Latino Pentecostal church in New York City, where study of the Bible, and especially memorization of biblical passages, was part of a continuous Christian education as children and adolescents, I want to remind my colleagues who teach in seminaries that there may be many students like this younger version of myself in your classes. I certainly can attest to how the academic study of religion in seminary helped me to expand my own religious horizons; how it helped me to see the use of the Bible as less of a private text that spoke to my spiritual needs and created in me an appreciation for the Bible as a text that spoke to humanity in ways that were much more profound than confessional statements. However, I also must say that I was able to make this shift precisely because I was so grounded in the text, because I had read the Bible, I had memorized it, because it was a text that connected to my life because it mattered. Our goal as professors in seminaries is not “to beat the Bible out” of students because we feel this kind of reading of the Bible is too simplistic, too literal, too unsophisticated, too unacademic, or too conservative. Our goal is to take that student’s love for the Bible and familiarity with the text and expand it, make it grow, and become even more real in their context. Our goal is to enable students to leave our schools and be able to build bridges for others in their communities and not to return to those communities filled with a pride that somehow they have been given the “truth” about the Bible (or about God), which their home church cannot comprehend and is not even able to comprehend. We want our graduates to succeed in their ministries because we have given them the tools and we have modeled for them respect and acceptance tempered with critical thinking and good intellectual inquiry. When we create in our classrooms a space that embodies respect for difference so that students can learn without fear of ridicule, we will have moved forward in our efforts towards creating the kind of theological education where students who have never read the Bible and those who have memorized much of the text can learn from one another and not sit in judgment of one another. In her book Teaching to Transgress, bell hooks notes: “Hearing each other’s voices, individual thoughts, and sometimes associating those voices with personal experience makes us more acutely aware of one another.” To be more “acutely aware of one another,” this is the kind of subversive teaching our theological schools need.